an interesting article by jim belshaw who studies our histories and languages from an academic view. but don’t let that put you off, he is easily readable. here he looks at the nsw language groups (map included) and how and why they are situated where they are. if a discussion arises from this post then so be it. I don’t think this follows (whether you mean large in territory or in population). Compare the size of language groups along other large rivers. Or one could equally suppose that assured water could be shared by many different groups each of whom need less territory. David’s comment was helpful because it highlighted an area where my thinking was arguably sloppy. For that reason, I decided to take the opportunity offered by David’s comment to clarify and extend my thinking. The material that follows should be read as musings, thoughts in progress. In their Prehistory of Australia, Mulvaney and Kamminga noted that there have been numerous attempts to map complexes of Aboriginal cultural traits throughout the continent that might help understanding of the major differences in language, social customs, mythology, artistic styles and technology.. To their mind, the 1976 explanation by Nicholas Petersen was the most persuasive. A Young James Belshaw outside the family home in 1948. Housing was very scarce in Armidale until the 1950s. To mark the 80th anniversary of the foundation of the New England University College in 1938, this is the second of a short series telling you a little of the story of the wives and children of the new College. Petersen observed that major cultural areas correspond with major drainage basins. He suggested that the reason for this is that the topography and environments of drainage basins tend to be internally uniform, while their margins are relatively poor in plant, animal and water resources. This led to more social interaction between groups living within the basin; much less between groups living on either side of the marginal zones. Petersen’s conclusions broadly fit with those that I reached in my own earlier work. However, I also considered that major geographic regions were important since the close relationship between the Aborigines and their environment meant that the patterns of Aboriginal life varied with changes to that environment. By implication, areas with similar environments were more likely to have commonalities in life and culture. To the degree that this conclusion is correct, we would expect similarities within New England’s major north-south zones, the humid coastal strip, tablelands, western slopes and western plains. Indeed, this does seem to have been the case. So at this level, we seem to have a clear if sometimes uncertain relationship between geography and language distribution linked to river catchments, as well as other major geographic features. We can extend this analysis by looking at the distribution of Aboriginal languages across NSW as a whole. The following map shows the distribution of Aboriginal languages across NSW as defined in The Encyclopaedia of Aboriginal Australia. There are a number of problems with the map in terms of names and boundaries, problems that I discussed in my 2010 paper delivered to a meeting of the Armidale & District Historical Society. We can ignore these for the present because we are interested in broad patterns. Look at the map first: my comments follow afterwards. If you look first at the bottom of the map, you will see a heavy concentration of languages. These follow the Murray River, a rich and densely populated Aboriginal area at the time of European colonisation. Much of the land along the Murray is semi-arid. Aboriginal populations concentrated on the river, living a semi-sedentary life. Here language territories effectively subdivide the riverine corridor. On the left of the map, there are a range of languages – a patchwork quilt – occupying larger territories. 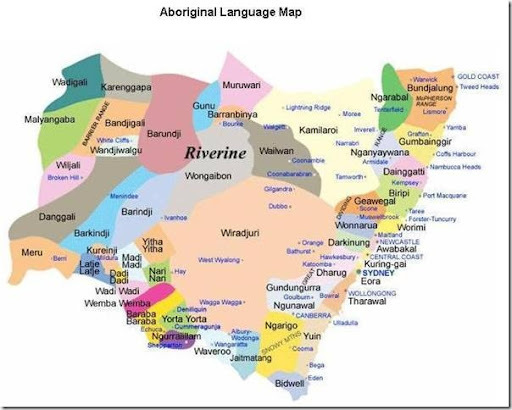 These are the languages of the Darling River and western deserts. Like the Murray, the Darling was quite densely populated, although densities were far less. The Darling is simply a smaller river. As with the Murray, languages ran along the river, but the relationship between river and language distribution is more complex, less certain. The variety in the desert languages to the west of the Darling is a factor of distance and small populations; languages and dialects diverged because of distance. To the right of the Darling, we find the two biggest language groups by area, the Wiradjuri and and the somewhat smaller Kamilaroi. They occupied the river valleys flowing to the west from the Great Diving Range. These were quite rich territories; language expansion was facilitated by geography, people could spread. Here another pattern seems to emerge. The broad sweep of languages along the Western Slopes and Plains, the riverine languages, seem clearly related, merging into the languages of the western deserts. Dividing lines are linked to rivers and catchments. However the relationship is not an exact one. Along the coast and adjoining ranges you have another dense distribution. On the coast, there is a clearer relationship between catchment areas and language distributions. We can think of this in both north-south and east-west terms. North-south, most language groups are directly related to catchments. The partial exception is the Clarence, the big river. There the sheer size of the river made it the divide between two very different language groups, the Gumbaynggirr and the Bandjalung. A third Gumbaynggirr related language, Daygirl, occupied the areas around the mouth of the Clarence. East-west, there appear to be language shadings inland. In the Hunter Valley, for example, the traditional presentation of language distribution has a coastal language with a linked inland language. The position further north appears somewhat similar. Bainbaa, the language spoken in the headwaters of the Nymboida River (a tributary of the Clarence to the south extending into the Tablelands near Guyra) appears to be a version of Gumbaynggirr. If we now drill down, we can see more of the relationships between geography and the distribution of people. The nature of the evidence means that our analysis must be uncertain. Still, patterns do seem to emerge. Traditional Aboriginal life was organised around family groups linked in a variety of ways with other family groups. Each family group occupied a particular territory or run. Groups gathered together for particular purposes, ceremonial or to take advantage of periodic food surpluses. There seems to have been a fair bit of what we would now think of as travel, longer journeys by individuals or small numbers for particular purposes including adventure or warfare. There were also traditional patterns of friendship or enmity. Relationships within and between groups were governed by a complex web of culture and tradition. While boundaries existed, they were not defined in the way we think of them today, hard lines on a map. Rather, boundaries are better thought of as a series of overlapping patterns divided by shaded lines. Boundaries shifted with time. Over time, the smallest unit, the extended family group, was vulnerable; warfare or changing local conditions could see their effective disappearance. We can see some of these forces in play in the stories associated with the Gunnedah Kamilaroi leader the Red Kangaroo, one of the few Aboriginal tales to have survived presenting a picture of the dynamics of Aboriginal life in New England in the pre-colonial era. Here we have a picture of internal group dynamics, of concerns about survival in a sometimes hostile environment, of warfare. By their nature, the larger language groups were more stable in geographic terms than smaller units, although here too it seems likely that boundaries shifted with time. The language groups were not political entities, rather groups that appear to speak common or at least related dialects. Each of the larger language groups covered a number of dialects, with the number determined by a combination of geographic coverage and population size. The Anaiwan or Nganyaywana Aboriginal peoples who occupied the southern areas of the New England Tablelands appear to have been relatively homogeneous and limited in number, although even here there is debate about the number of dialects. By contrast, the Bundjalung language group occupying territory stretching from the Clarence Valley into Southern Queensland may have had as many as twenty separate dialects. To the west, the Kamilaroi may have had at least five major dialects, seven if the related languages of Yuwaalaraay and Yuwaaliyaay are included. Bigambul, the language group on the slopes and plains in Queensland to the north was also reported to be close to Gamilaraay. My point in this discussion is that when we talk about geography and the distribution of people we are in fact talking about a complex hierarchy that moves up from the family group to the much larger language group. Australia is a very dry continent, marked by periodic droughts and floods. The inland rivers of the Murray- Darling Basin including the Murray have all stopped flowing for periods in recorded times. This affects not just water for human consumption, but also the vegetable and animal food supplies on which the Aborigines depended. It seems that the size and distribution of Aboriginal populations were broadly related to what we might think of as the carrying capacity of the country in bad times. However, this relationship was a variable one. Among other things, the human birth rate cannot be exactly matched to changing conditions. It seems likely that populations expanded during prolonged good times, then contracted. We have some evidence for this from the Murray River with its high population but smaller river dependent language territories. There skeletal evidence from burials shows signs of periodic malnutrition. Elsewhere in inland NSW, Aboriginal populations concentrated near water during dry periods, expanding across land at other times to take advantage of newly available water and food resources. Here we need to distinguish between local groups and larger entities. Looking at it from a language group perspective, as compared especially to the Murray language groups, both the Kamilaroi and Wiradjuri occupied large and varied territories running along the rivers from the Western Slopes out onto the Western Plains. This provided a variety of natural resources. During dry periods, population shifted within language group territories, although there may also gave been shifts at the margin between language groups recognising the shading of boundaries and the complexity of social relationships. Looking at it from a small group perspective, the size of runs varied depending on the area required to support the group. Putting this another way, the population density varied greatly depending on the geography. Here O’Rourke quotes various estimated population densities for different parts of Australia ranging from 1.3 square kilometres per person on the tropical coast, north east Arnhem Land to 200 square kilometres per person in arid central Australia. All these estimates are speculative. However, they illustrate the point that similar size groups required different size runs depending on geographic location. Even then, local groups were more vulnerable to extreme conditions than larger groups. From a language group perspective, the size of language groups was a function of area covered times population density. Some had only a few hundred speakers, others more than 10,000. O’Rourke’s guestimate of 10,000 for the pre-contact Kamilaroi population is probably not unreasonable, making them a large language group. By contrast, the Aboriginal language groups on the Northern Tablelands had far smaller populations, perhaps in the hundreds or low thousands, reflecting smaller territories as well as availability of natural resources. I have focused so far on the inland population. The coastal population including the large North Coast language groups had access to extremely rich environments combining land, riverine and the immediate estuarine and coastal strip itself. Like the Murray, some groups were semi-sedentary. My own original guestimate was that coastal population densities were perhaps twice that of the territory occupied by the Kamilaroi, although there were variations on the coast too, with lower densities in the upper river valleys as compared to the immediate coastal strip. The close relationship between immediate local environments and Aboriginal life including the size and distribution of the Aboriginal population is the reason why an understanding of micro-environments is so important in increasing our understanding of Aboriginal life. On the Northern Tablelands, for example, there appears to be a relationship between population distribution and soil types, for better soils provided a wider range of vegetable products as well as certain animal life. On the Liverpool Plains, ground water that fed springs probably played some role in maintaining what appears to have been a higher density population because it provided a better water supply in dry times. I have only begun to scratch the surface here in terms of my own understanding of the relationships between such variations and Aboriginal life, including the way in which Aboriginal responses affected the environment. An example is the way in which burning appears to have maintained the Liverpool Plains as a more open environment, increasing the supply of animal and vegetable foods. All very interesting, at least to me! Thank you for the compliment and for repeating the post. Part of the reason I write as I do lies in a desire to make Aboriginal history, especially in the broader New England, more accessible to both Aboriginal and non-Aboriginal people. A second reason is my desire to learn, to understand. In both cases, I want to tell a story.